Extended: if the flow is torn down before the configured delay, the flow-create event is not sent; an extended flow teardown event is sent instead. Denied: flow was explicitly denied from being created in the first place. A Denied no XLATE event shows that the event was denied and no translation of the source and destination IP addresses and ports is done. This is typical when using NAT addresses. Teardown: events indicate that an existing flow in the flow database of the appliance has ended. It could be due to “natural” causes (TCP: fin/fin-ack/ack, UDP: firewall times it out), or it could be a flow that has a problem detected midstream and the firewall shuts it off. The Teardown event will give you the total byte count (both inbound and outbound) for the entire flow in the octetTotalCounts field. 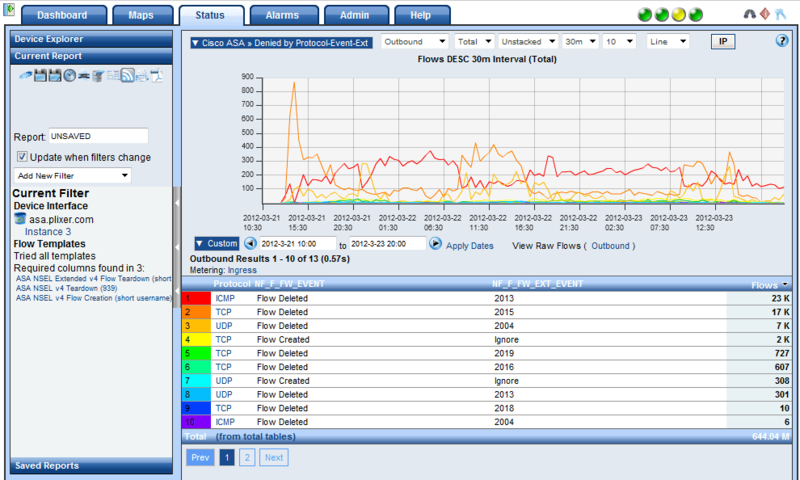 The above is similar to Cisco’s Smart Logging Telemetry Report which is available in the Catalyst 3750 NetFlow Support. We can also provide Cisco ASA syslog reporting. Anyway, these reports are part of our Cisco Advanced Reporting module and should help with your network traffic analysis efforts. Call support if you need help configuring Cisco ASA NetFlow .